I love being around people in general and I love playing tennis and being with tennis players, on-court and usually off-court as well. 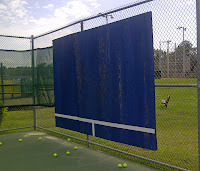 I love tennis backboards. Why? No people and no other tennis players. Ironic, huh? I had some spare time this afternoon and hadn't been to this local recreation center in quite some time, but I remembered it had this backboard for which I would have been surprised if it hadn't either pulled the fence down, disintegrated into saw dust or have been used in someone's fireplace by now. I've always enjoyed some work-out time with a backboard and I know this is not for everyone. Some people can't even play the game unless they have an auditory (not necessarily receptive) victim, even while on-court. Don't get me wrong; I am no introvert in any fashion and love social interaction, but some players could use a muzzle or their opponent's and partners need the ear protection found worn on aircraft carriers. I can't blame a backboard for not returning the ball, dinking it back to me or ripping me a new one unless I just fed it the same. "Return fire of like kind at first", we used to say in the Navy. There is no warm-up or hitting partner returning shots here at erroneous angles (well...perhaps so - more later) or simply missing the ball. 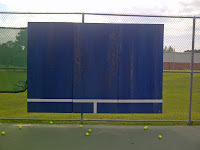 I get to work on close-in and distant shots, volleys, drops, baseline crushers, top spin, slice, whatever, while choosing to focus on footwork, rhythm, ball point-of-contact, most any aspect of my response to the coming ball and once I get more feel for a backboard I can challenge myself some with more angled and tougher shots to return. Except for the rare external noise or motion, I can enjoy this one-on-one time (so-to-speak) making this vertical plane of whatever material (they vary greatly) the best warm-up partner I would ever want or the nastiest pro or coach I never would expect. There are a variety (shape, size, versatility) of backboards out there, but if you truly want to kick it up a notch and make things even more challenging, I recommend the OctaCurve Mach III as seen above and below. 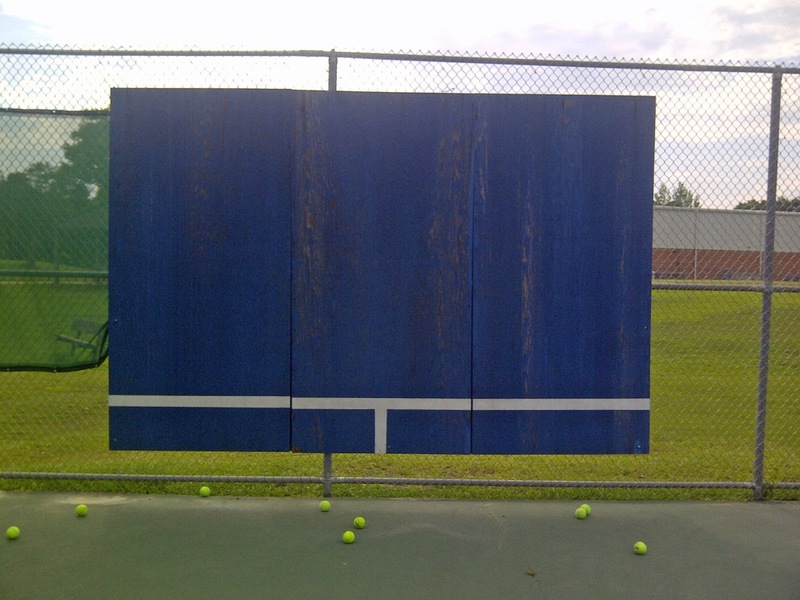 The design (aged degradation actually) of this backboard which makes it so challenging is that each panel's side is bowing toward you. Oddly enough they have warped equally (forward-looking engineering), resulting in eight curved edges effectively. Hence, "OctaCurve", in case you weren't following along. "Mach III" - three panels. I know - you get it. Sleek, isn't she? This is when it gets so damn near realistic: If you are hitting accurately, center of or near center of one of the panels, which is not too far from when your brain decides to more or less go left, right or center during match play, then you're fine and the return will probably be the reflective angle of impact and the pace will be directly proportional to the pace you gave the ball. Aha, but don't send the ball accurately and that imaginary net player may sharply redirect the ball or that back-court (yes, imaginary) player may send you scurrying wider than you expected. Those eight curves are there for a reason. I'm certain this was included in the design process. You may get so frustrated and angered, you are tempted to lob the OctaCurve Mach III, but don't. No one is going to be impressed if you tell them you took a point from a backboard by lobbing it. If you so choose to lob the OctaCurve Mach III, do not show too much pleasure in doing so or give yourself a fist pump - someone may be watching. Please forgive the rec center staff for the net (painted) height being about two feet. Perhaps they thought overheads would be easier this way. 1. If you focus on and are able to accurately nail the panels about dead center, your shot accuracy will most likely improve. 2. If are unable to successfully target the panels, your shots will either become more accurate out of necessity, you will walk off the court totally disgusted with yourself or you will sustain an injury. You cannot afford not to focus when using the OctaCurve Mach III - this is fantastic mental, visual and physical training. 3. You will fall in love with the Mach III, becoming so proficient with it that you may try to pound her with some crushers, hoping you will be the first one to take (knock) her down. It won't happen - I believe this unit was here before Hurricane Hugo and that was a long time ago. But don't waste your time searching out an OctaCurve. They are as rare as they are engineering marvels and beautiful pieces of art. Instead, check out what your club or other facilities in the area have to offer. 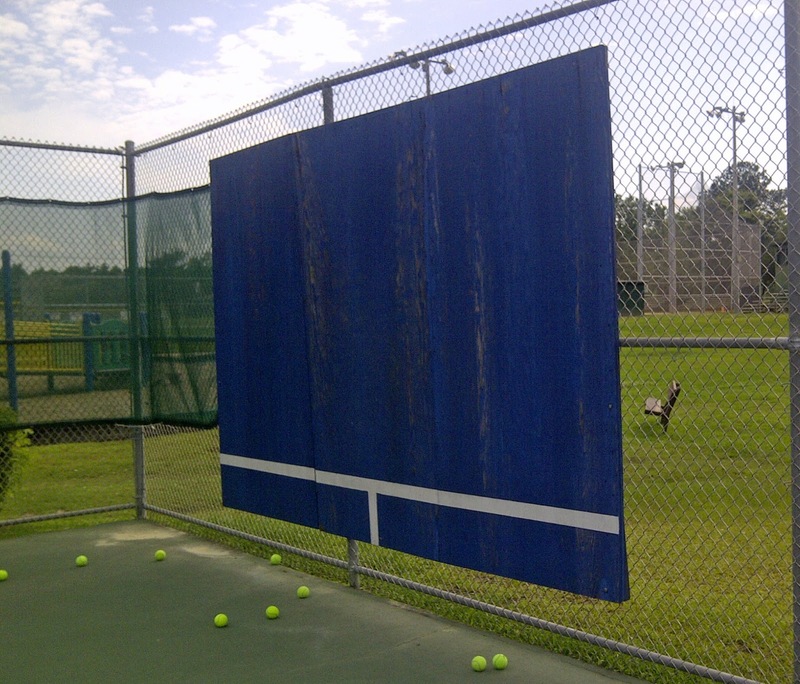 There are a wide variety of quality backboards out there providing their own aspects of tennis training. 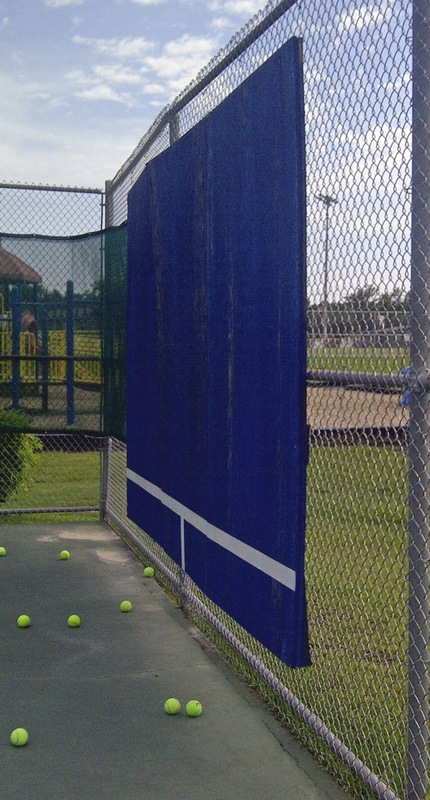 Or, if you wish to have a similar training device at your home or ranch, then check out a rebounder net like the one below. To search our blog use the search field in the upper left corner. Copyright © I Toad You So 2016. Awesome Inc. theme. Powered by Blogger.